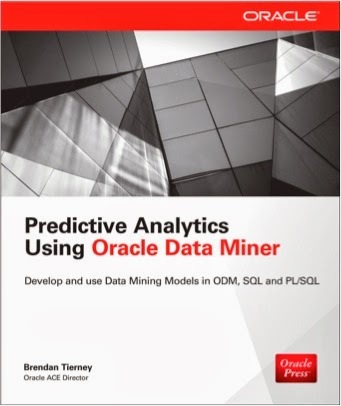 This is the third blog post of a series on using Oracle Text, Oracle R Enterprise and Oracle Data Mining. Check out the first and second blog posts of the series, as the data used in this blog post was extracted, processed and stored in a databases table. This blog post is divided into 3 parts. The first part will build on what was covered in in the previous blog post and will expand the in-database ORE R script to include more data processing. The second part of this blog post will look at how you can use SQL to call our in-database ORE R scripts and to be able to include it in our custom applications, for example using APEX (part 3). In my previous blog post we created an ORE user defined R script, that is stored in the database, and this script was used to perform text mining and to create a word cloud. But the data/text to be mined was processed beforehand and passed into this procedure. But what if we wanted to have a scenario where we just wanted to say, here is the table that contains the data. Go ahead and process it. To do this we need to expand our user defined R script to include the loop to merge the webpage text into one variable. The following is a new version of our ORE user defined R script. To call this R scipts using the embedded R execution we can use the ore.tableApply function. Our parameter to our new R script will now be an ORE data frame. This can be a table in the database or we can create a subset of table and pass it as the parameter. This will mean all the data process will occur on the Oracle Database server. No data is passed to the client or processing performed on the client. All work is done on the database server. The only data that is passed back to the client is the result from the function and that is the word cloud image. Another way you ccan call this ORE user defined R function is using SQL. Yes we can use SQL to call R code and to produce an R graphic. Then doing this the R graphic will be returned as a BLOB. So that makes it easy to view and to include in your applications, just like APEX. 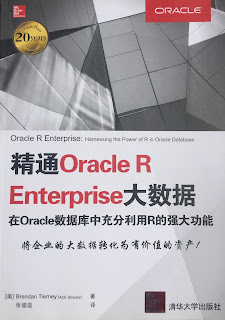 To call our ORE user defined R function, we can use the rqTableEval SQL function. You only really need to set two of the parameters to this function. The first parameter is a SELECT statement the defines the data set to be passed to the function. This is similar to what I showed above using the ore.tableApply R function, except we can have easier control on what records to pass in as the data set. The fourth parameter gives the name of the ORE user defined R script. This is the image that is produced by this SQL statement and viewed in SQL Developer. Adding the SQL to call an ORE user defined script is very simple in APEX. You can create a form or a report based on a query, and this query can be the same query that is given above. Something that I like to do is to create a view for the ORE SELECT statement. This gives me some flexibility with some potential future modifications. This could be as simple as just changing the name of the script. Also if I discover a new graphic that I want to use, all I need to do is to change the R code in my user defined R script and it will automatically be picked up and displayed in APEX. See the images below. WARNING: Yes I do have a slight warning. Since the introduction of ORE 1.4 and higher there is a slightly different security model around the use of user defined R scripts. Instead of going into the details of this and what you need to do in this blog post, I will have a separate blog post that describes the behaviour and what you need to do allow APEX to use ORE and to call the user defined R scripts in your schema. So look out for this blog post coming really soon. In this blog post I showed you how you use Oracle R Enterprise and the embedded R execution features of ORE to use the text from the webpages and to create a word cloud. This is a useful tool to be able to see visually what words can stand out most on your webpage and if the correct message is being put across to your customers. 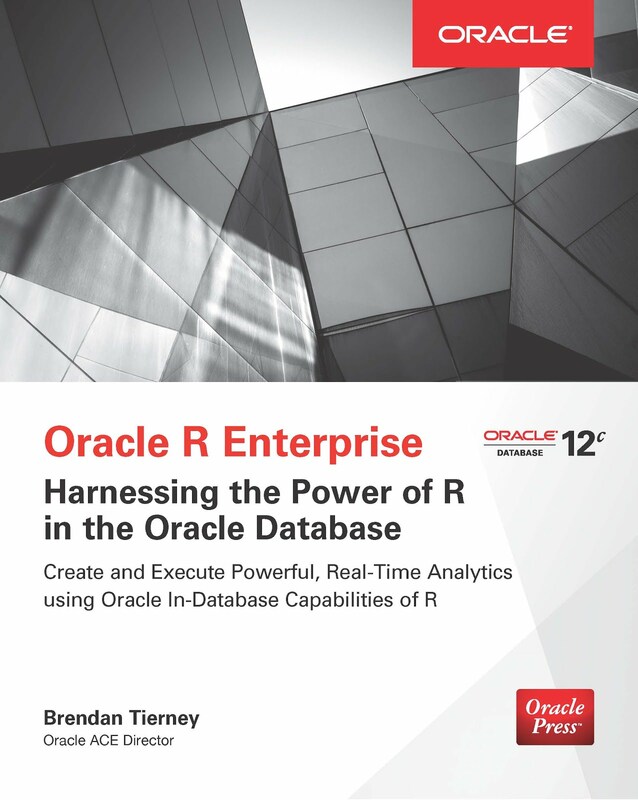 Oracle R Enterprise comes with a vast array of features that not really documented anywhere. One of these features that I've recently found useful is the ore.recode() function. The following code illustrates how you can records the values in an existing attributes or (more specifically in this example) how you can create a new attribute based on the values in another attribute. The data set that I'm using is the White Wine data set that can be found on the UCI Machine Learning Repository Archive website. You can download this data set and load it into a table in your Oracle schema using just two commands. This data set has an attribute called "quality". This "quality" attribute contains values ranging from 2 to 8, and indicates the quality of the wine. A typical task you may want to do is to relabel values into attributes to something a bit more meaningful or to group some values into a more standardised value. To demonstrate this I want to create a new attribute that contains a description of the type of wine (and who I might share it with). The next step we need to perform is to gather some information about the values in the "quality" attribute. We can use the table command to quickly perform the aggregations, and then use the marplot function to graph the distributions. Now we are ready to perform the recoding of the values using the ore.recode() function. You can now go and inspect the data, perform a frequency count and compare the values with what we had previously. The final step is to write the newly modified data set back to your Oracle schema into a new table. This is to ensure that the original data is modified so that it can be used or reused later. The following is the fifth and final set of demo code from my video on using R in the Oracle Database. Check out the video before using the following code. The blog post for the video will be updated to contain links to all blog posts that have the various demo code. The following is the fourth set of demo code from my video on using R in the Oracle Database. Check out the video before using the following code. The blog post for the video will be updated to contain links to all blog posts that have the various demo code. 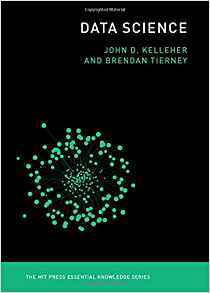 The following code example illustrate how you can build a Data Mining model using the in-database data mining algorithms. In this example a Decision Tree model is created. This model is then applied to new data, scoring this data with the predicted values. The following is the third set of demo code from my video on using R in the Oracle Database. Check out the video before using the following code. The blog post for the video will be updated to contain links to all blog posts that have the various demo code. The following code is illustrates some simple examples of using Oracle R Enterprise. 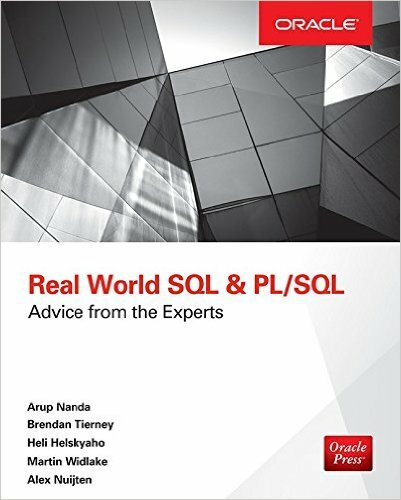 In these example you will see how to connect to the Oracle Database, how to query and process some of the tables and views in the Oracle Database, how to check that you are working with objects in the database, how to move data to the database and query it. 1  101501           F  41              NeverM United States of America J: 190,000 - 249,999   Masters      Prof.
3  101503           F  20              NeverM United States of America H: 150,000 - 169,999   HS-grad    Cleric. Earlier this year I was asked by the Business Analysics & Big Data SIG (of the UKOUG) to give a presentation on Oracle R Enterprise. Unfortunately I had already committed to giving the same presentation at the OUG Norway conference on the same day. But then they asked me if I could record a video of the presentation and they would show it at the SIG. The following video is what I recorded. At the UKOUG annual (2015) conferences I was supposed to give a 2 hour presentation during their Super Sunday event. Unfortunately due to a storm passing over Ireland on the Saturday all flights going to the UK were cancelled. This meant that I would miss my 2 hour presentation. Instead of trying to find an alternative speaker for my presentation slot at such sort notice, the committee suggested that they would show the video. Based on the feedback and the people who thanked me in person during the rest of the conference, I've decided to make it available to everyone. Hopefully you will find it useful. The following are the links to the demo code that is shown or referred to in the video. People have been asking me if the demo scripts I used in video are available. You will probably find some of these on various blog posts. So to make it easier for everyone I will post the demo scripts in one or more blog posts over the coming weeks. When these are available I will update this blog post with the links. I have a few new presentations on Oracle R Enterprise in 2016 so watch out for these at an Oracle User Group conference. If you have tried to use the ore.odmGLM function in ORE and some other functions in ORE and you are using the Oracle 12.1.0.2 Database you will be getting an error something like the following in R.
Similarly if you are using these functions with embedded R execution when the R code is warpped in SQL, you will see similar errors. What you need to do is to download and install the stand alond Patch 20173897. Alternatively this patch is included in the latest Oracle 12.1.2 Database patch. At Oracle Open World (OOW15) I gave 2 presentations on the Sunday during the Oracle User Group Forum. The slides are now available for download from the Oracle Open World website. During this sessions I was one of 16 presenters talking about various features in the Oracle Database. All of the presenters where from the EOUC region. I co-presented with Antony Heljula from Peak Indicators. During this presentation we talked about some of the Advanced Analytics projects we have worked on over the past 18-24 months. 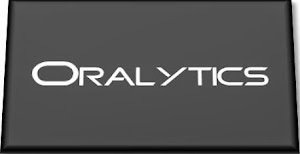 We also announced a new Analytics-as-a-Service offering. The slides are also available for most of the other Oracle Open World Presentations and these can be accessed here. Just go search for the topic you are interested in. Check out my previous blog post that summarises just a small part of what I got up to at OOW15. When working with ORE you will end up creating a number of different data stores in the database. Also as your data science team increases the number of data stores can grow to a very large number. When you install Oracle R Enterprise you will get a number of views that are made available to ORE users to see what ORE Data stores they have and what objects exist in them. All using SQL. When using these ORE function the schema user/data scientist can see what ORE Data stores they have. You can use the ore.delete to delete an ORE Data store when it is no longer needed. But the problem here is that over time your schemas can get a bit clogged up with ORE Data stores. Particularly when the data scientist is not longer working on the project or there is no need to maintain ORE Data stores. This is common on data science projects when you might have a number of data scientists work in/sharing the one database schema. For a DBA, who's role will be to clean up the ORE Data store that are no longer needed, you have 4 options. The first of these, is if all the ORE Data stores exist in the data scientists schema and nothing else in the schema is needed then you can just go ahead and drop the schema. The second option is to log into the schema using SQL and drop the ORE Data stores. See an example of this below. The third option is to connect to the Oracle schema using R and ORE and then use the ore.delete function to drop the ORE Data stores. The fourth option is to connect to the RQSYS schema. This schema is the owner of the views used to query the ORE Data stores in each schema. After the RQSYS schema was created it was locked as part of the ORE installation. You as the DBA will need to unlock and then connect. The following SQL lists the ORE Data stores that were created for that schema. You can also view what objects have saved in the ORE Data store. To drop an ORE Data store for you current schema you can use the rqDropDataStore SQL function. For the DBA when you unlock and connect to the RQSYS schema you will be able to see all the ORE Data stores in the data. The views will contain an additional column. But if you use the above SQL function to delete an ORE Data store it will not work. This because this SQL function will only drop and ORE Data store if it exists in your schema. If we have connected to the RQSYS schema we will not have any ORE Data stores in it. We can create a procedure that will allow use to delete/drop any ORE Data store in any schema. We are the DBA, logged into the RQSYS schema can now delete any ORE Data store in the database, using the following.